U.S. 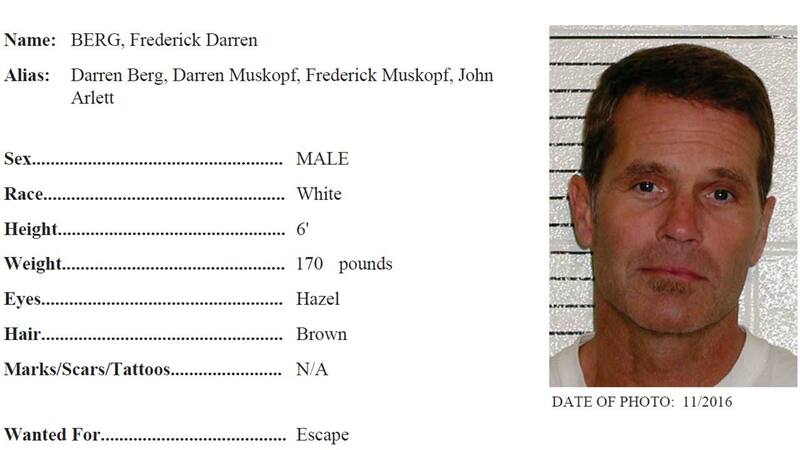 Marshals are searching for Frederick Darren Berg, 55, who escaped from the U.S. Penitentiary Atwater Satellite Prison Camp Wednesday. Berg is responsible for one of the largest Ponzi schemes ever prosecuted Washington state history. Berg is a white male, 6 feet tall, 170 pounds, with brown hair and hazel eyes. He was sentenced in 2012 in U.S. District Court in Seattle to 18 years in prison for wire fraud, money laundering, and bankruptcy fraud. He has more than 10 years left on his sentence. Berg was also ordered to pay more than $140 million in restitution. Berg was the founder of the Meridian Group of investment funds. The funds represented that $245 million in investor money was invested in real estate contracts and real estate; however, the funds were actually elaborate Ponzi schemes. At sentencing, U.S. District Judge Richard A. Jones told Berg he had "reckless disregard for his victims and had no moral compass." To report any tips or sightings of Berg, contact the U.S. Marshals on 800-336-0102.